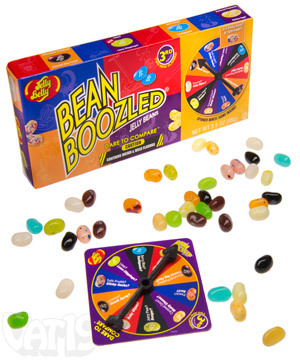 BeanBoozled is the Russian Roulette of candy games. Each box is filled with both delicious and strange flavors. The catch is that you cannot tell what you're going to get until you eat it! There are ten differently styled Jelly Belly Jelly Beans in each box. 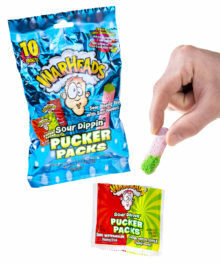 Each style has both a tasty flavor and a downright strange flavor. For example, you'll never know if you're going to get caramel corn or moldy cheese; licorice or skunk spray; coconut or baby wipes. Tasty or nasty? There's only one way to find out! Jelly Belly, the masters of authentic flavors, have created an amazing experience with BeanBoozled. Each box contains 10 different styles of beans. 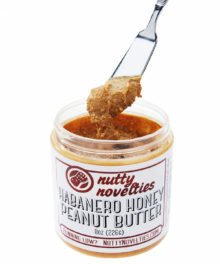 However, the flavors associated with each style are either super tasty or downright crazy. Remember, both possibilities look identical to each other! 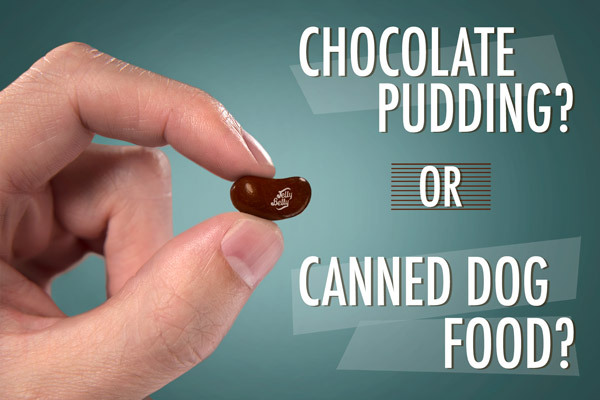 For example, the black jelly bean tastes of either delicious chocolate pudding or funky canned dog food. The light blue bean is either berry blue or toothpaste. Not knowing what you're going to get makes for quite a bit of fun! 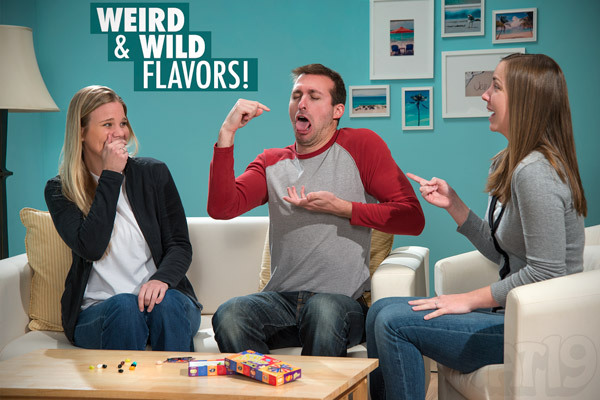 With BeanBoozled, you never know what you're going to get until you take a bite! Go ahead... play with your food! 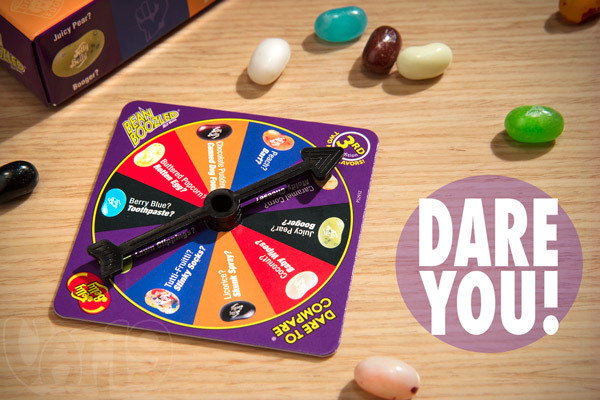 BeanBoozled is packaged with a small spinner wheel that illustrates all of the flavor possibilities. Get a few friends together, spin the wheel, and take your chances! That tasty-looking bean, yeah, that may be peach... or it may be barf! Use the included spinner to decide which bean to try next. The agony of defeat is a real treat... for your friends! Watching somebody else eat something that tastes terrible is a lot more fun than it probably should be. 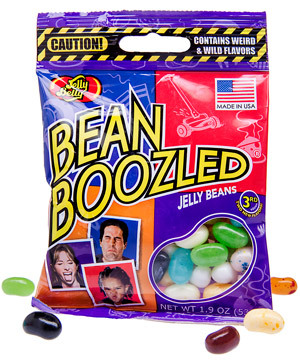 With BeanBoozled, you're getting a box full of fun at your friend's expense. 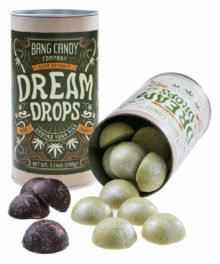 You'll have a grand ol' time watching friends and family slowly bite into a bean, wishing and praying for coconut, but ultimately recoiling in disgust as the taste of spoiled milk overwhelms their senses. Here's the current list of beans. We dare you to try them all! He was hoping for chocolate pudding, but we'd venture to guess he got canned dog food instead. Answer: Sugar, corn syrup, modified food starch, contains 2% or less of the following: peach puree concentrate, pear juice concentrate, lime juice concentrate, coconut, chocolate liquor, cocoa butter, soy lecithin (an emulsifier), cocoa powder, citric acid, lactic acid, sodium citrate, sodium lactate, natural and artificial flavor, ascorbic acid (vitamin C), color added, red 40 lake, blue 2 lake, yellow 5 & 6, red 40, blue 1, blue 1 lake, vegetable and fruit juice (color), beeswax, carnauba wax, confectioner's glaze, tapioca dextrin, salt. Question: Do they taste good? Answer: Well... about half of them do! 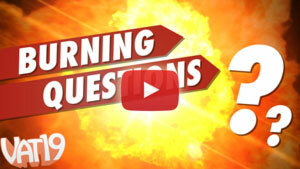 Answer: A serving size is approximately 35 pieces (2.5 servings per container). 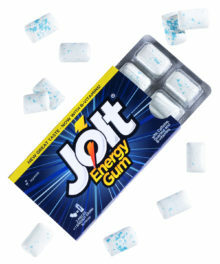 Calories = 140, Total Fat = 0g, Sodium = 25mg, Total Carbohydrate = 37g, Sugars = 28g, Protein = 0g. Question: How much do you get in a box? Answer: Each box contains approximately 85-90 beans. There are ten different colors/styles. Each color/style can be one of two flavors. So, there are twenty different flavors in each box. Question: What's the deal with the refill bags? Answer: The refill bags include about 45-50 beans. They feature all the same flavors as in the box, but there are simply fewer beans and there is no spinner wheel.